A few years ago, I managed to sample some of the beauty and fragrance products sold only in England by B Never Too Busy To Be Beautiful, a sister company of Lush. (You always want what you can't have.) Then B Never closed its doors in late 2009, and I was sad that I'd never be able to sample its wares again. Recently, thank goodness, several former B Never Too Busy To Be Beautiful fragrances were re-released under the auspices of Lush's Gorilla Perfumes. I enjoyed revisiting B Scent last year, and now I'm happy that even more scents from the original line have reappeared and are available to international online shoppers. Cocktail is one fragrance that I enjoyed in those B Never days and then missed when my sample was finished. Coming back to it, I'm finding it unchanged and just as oddly appealing as it was to me when I first wore it. Cocktail is billed as an homage to classic French perfumery; Mark Constantine, the founder of Lush, has also said, "Cocktail is preparing to go out for the evening with a chic drink in hand. It’s the perfect companion after dark." Its notes include ylang ylang, cananga, jasmine, rose, orange blossom, oakmoss, and sandalwood. As Erin mentioned a few months ago, ylang ylang is the star of this mix; in fact, it plays a few parts. In its various grades and phases of distillation, ylang ylang's smell ranges from fruity to woody-leathery to slightly medicinal. You'll be able to detect all these facets of ylang ylang's personality in Cocktail. After a dissonant herbal opening that seems to have quite a bit of lavender, Cocktail gives off slightly weird aspects of camphor and wintergreen; this is one strain of the ylang ylang, and it's interesting, if somewhat quirky for a personal fragrance. Then Cocktail turns the corner with a fruitier grape-jam note, which dissolves into the fragrance's rose/jasmine/ylang heart. The ylang ylang, which is now present in a creamy-rubbery incarnation, is stronger than the other floral notes. I'm also wondering whether there might be some cassie (acacia) in the mix. These notes form a warm, slightly powdery heart, and although it does turn more and more flowery, there's still something about this part of the fragrance that reminds me of SweeTarts candy. Its combination of notes also evokes a memory of my grandmother's purse and its contents: the leather, the pack of Certs mints, the waxy Avon lipstick, and the traces of floral perfume on a handkerchief. Like most of the scents from Gorilla Perfume, Cocktail varies from wearing to wearing on me; sometimes, the peculiar herbal opening lasts for a while, and sometimes it fades into the ylang ylang and florals within ten minutes or so. (I'm guessing this is a result of Cocktail's high percentage of natural ingredients, another Gorilla trademark; I remember having a similar experience with Imogen Rose.) Cocktail has good staying power, and it leaves delightful traces of scent on a jacket cuff or the edge of a scarf. What about the name? In addition to feeling like an evening-out fragrance from another era, Cocktail does remind me of certain actual cocktails, with vintage recipes that combine sweet and sharp notes. (I do enjoy drinks that contrast ingredients in that way; a particular favorite of mine is the "Aviation," which includes gin, lemon juice, maraschino liqueur, and Crème de Violette. Actually, that blend could inspire an interesting fragrance!) If you like to wear ylang-y floral compositions and you're open to something unusual and a little bit unpredictable, this Cocktail is worth a sip, or rather, a sniff. Gorilla Perfume at Lush Cocktail is available in 10 or 30 ml spray ($15.95 or $39.95) or as a 12 g solid perfume ($13.95). For purchasing information, see the listing for Lush under Perfume Houses. 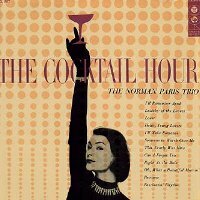 Note: top left image is the album cover for The Cocktail Hour by The Norman Paris Trio, released in 1956. I’ve been trying to figure out that note was and you’re right: grape jam! I really do like this one and wish it was available at the Lush stores in North America. (Dirty showing up locally makes me hopeful.) Similarly, I wish a wider distribution on B Scent (which I ordered from the UK and then broke on my kitchen floor! *sob*) and the newish Smell of Weather Turning. And I want to try that Aviation! I need to get some, actually, since I’ve used up my sample vial (and spilled some of it, alas!). You’re right, it would be even nice to be able to buy these scents in-store, but having them available online is a step in the right direction. Cheers! I gt he newsletter, they’re all (allt he ones I know of at the moment,) available to order online from LushUS, though I don’t see the samples any more. Oh good lord, look at that mess. I’m tired, but not that freaking tired! I get the newsletter, and all the Gorilla perfumes I know of at the moment are available online at LUSHUS under the Gorilla Perfumes tab. Not a mess at all, and yes, this is really good news!! Hope you’ll be able to find them, HKM… it’s a very interesting line! I’v tried 4 of the solids in the line: the smell of freedom (just lemongrass on my skin, icky), ginger (I like ginger as a note, but in this, it makes me queasy), Imogen Rose (starts off vinegary and pale – though others like it on me at this stage too. Then it blooms into something gorgeous) So, my verdict on that one is a bit mixed. The last one I tried is 1000 Kisses Deep and I luuuuurve this one – a fruity woody osmosis. And great to wear when I am feeling hay-feverish. A friend is bringing me B Scent, Breath of God and Karma, all in solids, but now I’m wanting this one too! I feel the same way about Imogen Rose’s development… and I really need to try 1000 Kisses next!! Thanks, Merlin. Haha, I only formulated it so exactly BECAUSE I had, at some point, read your fantastic review and it totally captured my experience!